Greenhouse Gases are gases that absorb and emit radiation within the thermal infrared range. Those in Earths atmosphere are mostly water vapour, carbon dioxide, methane, nitrous oxide and ozone. Whilst necessary, as without them the Earths temperature would be around -18°C, humans have caused an increase of 40% in the atmospheric concentration of carbon dioxide, which in turn is leading to the warming of the planet and other associated issues such as ocean acidification, rising sea levels and species loss. It is therefore vital that we stay aware of our impact on the planet, and do our best to manage greenhouse gas emissions. The GHG Protocol is the most widely used accounting tool to manage, understand and quantify greenhouse gas emissions. Used by government and business leaders, the GHG Protocol is a decade-long partnership between the World Resources Institute (WRI) and the World Business Council for Sustainable Development (WBCSD). It serves as the foundation for almost every greenhouse gas standard in the world, as well as offering an internationally accepted tool for businesses to compete in a global marketplace. We are now working towards achieving the GHG Protocol Mark, which will allow us to have the backing of the WRI and the WBCSD on the certifications we issue. Our tool will adhere to their standards, enabled by our BETA customers who have enabled us to pay for the audit. This will enable us to help companies achieve further certification, beyond the ISO 14001, ISO 50001, ISO 20121, BS 8555 and B Corp certifications we already offer. Being a part of the GHG protocol means a lot to us. It goes beyond allowing companies to measure, manage and report their greenhouse gases, as it gives our customers a competitive edge on the marketplace. In 2016, at least 92% of Fortune 500 companies responding to the Carbon Disclosure Project used the GHG Protocol, only strengthening its reputation amongst market leaders. Incorporating this into our system facilitates competition with these corporations, and will allow businesses with our certification to strengthen their position. The GHG Protocol will allow us to strengthen our carbon footprint certification, and put your business in a better position as a B-Corp. If you have any questions about the GHG Protocol or your organisations carbon emissions, get in touch with us via our contact page. In our modern era of a warming climate and ever increasing awareness, there is a myriad of terms that we, as a population, may only be partly aware of. ‘Carbon footprint’ is one of those, and it’s full meaning is something of great importance. In short, a carbon footprint is an estimate of the impact an activity has on our changing, warming, climate. It is a calculation of several aspects: greenhouse gas sources, notably CO2, methane and nitrous oxide; any influencing carbon sinks; and various forms of carbon storage. Then, for the sake of simplicity, all impacts are tallied and expressed as a single number in terms of CO2 equivalent – that is, the amount of CO2 that would need to be emitted to achieve the same level of warming. Taking a plastic bottle, for example, it may seem simple to calculate its emissions – they would come from the extraction and processing of the oil to turn it into the bottle. However, there are several uncertainties that come into the equation, including the energy used to extract, refine and transport the oil, and the transport involved in moving the final product. Furthermore, one could try to account for the use of paper in the administration of the plastic bottle company, the electricity their computers use and their use of printer paper. It can, effectively, be calculated to an infinitesimal point. However, this is far too complex, and the estimation of a carbon footprint is therefore based off what is feasible to measure. Small intricacies may not make the final calculation, but any major contributors, such as fuel usage, general conditions and transport logistics, may come in to play. Given this, the carbon footprint calculation is a very powerful tool when it comes to understanding the impact of your behaviour, be it as an individual or collective, on global warming. Calculation and constant monitoring of your carbon footprint is essential to keeping it as low as possible, thus decreasing your harm to the planet. 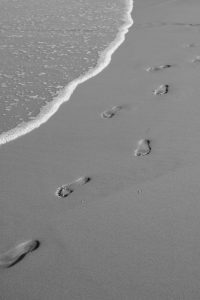 There are several incentives to knowing what your carbon footprint is and acting on it. First of all, there is a moral incentive to keep your carbon emissions as low as possible and make a contribution to slow down global warming. Secondly, there is a business incentive, whereby businesses will be more inclined to trade with you and you will attract better people, both as employees and clientele. Finally, depending on your location, tax breaks may be available if you lower (and can prove) that you have lowered your carbon emissions, and are continuing to do so. Carbon offsetting can be a hard idea to come round to, but is in reality quite a simple concept. Schemes allow individuals and companies to make a financial contribution to environmentally friendly projects around the world to stabilise their own emissions, be it from travel, day-to-day energy use or material consumption. These may take shape in a variety of forms, including the deployment of clean energy technologies, purchasing carbon credits and tearing them up, or, in a more direct application, planting trees to soak up CO2 in the atmosphere. The costs vary, but will usually equate to around £8 per tonne of carbon offset. For example, a flight from London to Sydney would produce around 2.64 tonnes of CO2 per passenger, so would cost around £22 to offset. Carbon offsetting may seem like an unnecessary cost to a holiday or business, but it’s a simple, effective and cost-efficient to lessen our negative impact on the world. 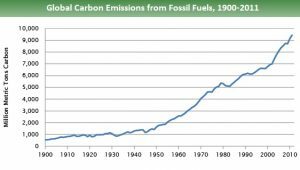 Our carbon emissions from fossil fuels alone have risen substantially since the beginning of the 20th century, with the warming effects visible now and in the future. However, the positive effects of carbon offsetting are not only environmental. Several governments around the world have introduced incentives for companies to reduce their carbon emissions. The UK government, for example, offers tax relief on the Climate Change Levy (CCL) if steps are taken towards reducing emissions by entering a Climate Change Agreement (CCA) with the Environment Agency. Global carbon emissions from fossil fuels. KLM, the Dutch Airline, have taken it into their own hands and have developed a comprehensive scheme to offset the emissions from their flights. They have partnered with a Ghanaian enterprise that has developed a special coalpot which is 40% more efficient than its traditional counterparts, resulting in annual savings of around 300,000 tonnes of carbon emissions each year. This has also curbed deforestation, as less coal is needed to fuel the stoves. This shows how carbon offsetting has changed from just planting trees, which has a short-term effect. Carbon offsetting has moved to more innovative solutions, helping people offset their carbon in ways that will change their lives and their carbon output in the long term. You can also look to reduce your footprint on the world. Think about it next time you travel or turn the heating on, as there could be a cost-efficient way to reduce your impact on the world. If you would like to find out more about your or your organisation’s emissions, please get in touch via our contact us page. https://compareyourfootprint.com/wp-content/uploads/2016/10/logo-1.png 0 0 Will https://compareyourfootprint.com/wp-content/uploads/2016/10/logo-1.png Will2017-02-27 12:45:062017-02-27 12:51:07What is Carbon Offsetting?